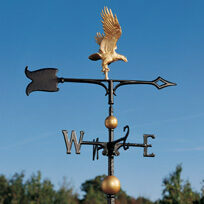 We supply fine-crafted home and garden accents by Whitehall Products. Products are hand crafted from rust-free recycled aluminum. 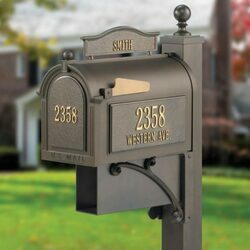 Renowned as the world’s largest manufacturer of weathervanes, personalized name and address plaques, and mailboxes. Whitehall also produces hundreds of other decorative home accents including clocks, thermometers, bells, wall décor, sundials, and other landscape accents. Call us to order one of these lovely accent pieces and and we will drop ship it directly to your door. Discounts available with installations. Call us for information and prices. 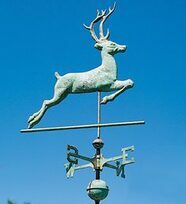 We supply weathervanes by Whitehall Products, the world’s largest manufacturer of weathervanes, with over 100 different styles. Many styles include a variety of color choices such as traditional black, aged verdigris or antique copper, polished copper ornaments, gold-bronze ornaments, and even hand-painted ornaments. 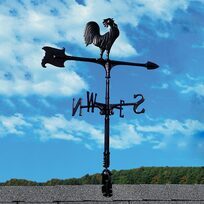 Whitehall’s more than 70 years of weathervane making experience assures you will receive a carefully crafted and meticulously detailed weather instrument that will provide a lifetime of enjoyment. Whitehall Home Accents include decorative all-weather clocks and thermometers, patriotic wall eagles and flagpole eagles, welcome mats, country bells, and weathervanes. See ALL images below in Our Home Accents Image Gallery. 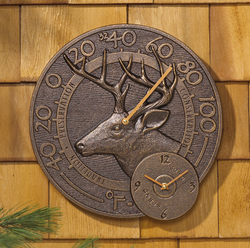 Whitehall Products clocks and thermometers combine functional quality with a unique decorative flair and may be used indoors or out. The rust-free durability of recycled aluminum, upscale paint finishes, and unique designs all combine for that perfect accent. Each Whitehall Clock and thermometer is completely assembled and made in the USA. Colors: French Bronze, Antique Copper, Bronze Verdigris, Copper Verdigris, etc. 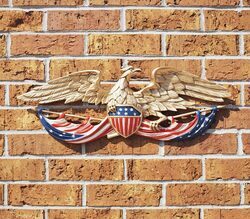 Add a touch of American Heritage to your home with this patriotic wall eagle. 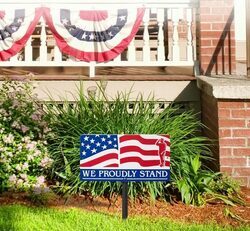 The high relief profile enhances your home décor while showing your American pride. Choose wall colors: Black or Antique Brass (shown). Add a touch of flair and originality to any home with these decorative doormats. Personalize these mats with your name or any greeting. Natural Coir Fiber Looks Beautiful And Keeps Shoes Free Of Dirt! Long lasting weather resistant paint. Whitehall country bells will add an old-fashioned flair indoors or out. You can sound this bell in celebration, round up the troops, or use for a decoration. 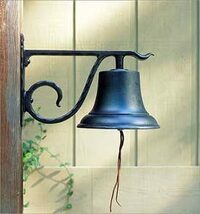 These bells are handcrafted from rust-free recycled aluminum and finished with weather-resistant paints to last a lifetime. A leather cord is attached to the clapper to clang the bell. The bell is attached to a bracket for easy installation. Made in the USA. Choose from Large (8 x 8 x 13 in) or Medium (5 x 5 x 6 in) bell. Whitehall mailboxes are designed to last a lifetime. All components are manufactured from recycled, die cast, rust-free aluminum and finished with weather-resistant, powder coat paint. The Whitehall mailbox comes with a lifetime warranty. Designed to last a lifetime, all components are manufactured from recycled, die cast, rust-free aluminum and finished with weather-resistant, powder coat paint. The mailbox is 20% larger than most mailboxes to hold multiple day’s worth of mail. Comes with a lifetime warranty. 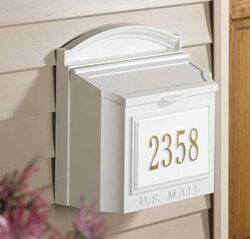 Dimensions: Mailbox: 14.5" x 15" x 8"
Wall Mailbox Package includes the wall mailbox with a personalized insert. Personalized: Wall Insert hold up to 5-3" characters OR 5-3" characters and 11 - 1.25" characters. Choose colors: Black, White (shown), or French Bronze. 20% larger than most mailboxes. All components are manufactured from recycled, die cast, rust free aluminum and finished with a weather resistant powder coat paint. 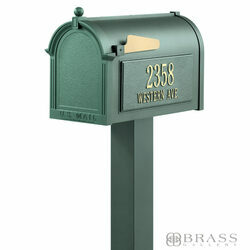 Premium Package includes the mailbox with standard post and 2 personalized side address plaques. Choose colors: Black, French Bronze, Green (shown), or White. 20% larger than most mailboxes. Manufactured from die cast rust free aluminum and has a weather resistant powder coat finish. 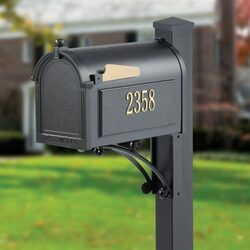 Superior Package includes the mailbox with 2 personalized side address plaques, decorative brackets, and deluxe post with decorative post cap. Choose colors: Black (shown), French Bronze, Green, or White. The very best mailbox available. Manufactured from die cast rust free aluminum with a weather resistant powder coat finish. 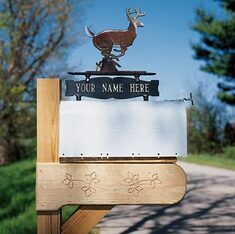 Includes mailbox with 2 personalized side address plaques, personalized 2-sided topper, personalized door plaque, newspaper box, decorative brackets, and standard post with decorative finial. Personalized: Topper holds up to 16 - 1.25" characters; Door Panel holds up to 6 - 1.75" characters; Side Panels hold up to 5 - 4.5" numbers OR 5-3" characters and 16 - 1.25" characters. Choose colors: Black, French Bronze (shown), Green, or White. 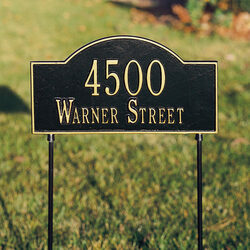 Add the finishing touch to your Whitehall mailbox by adding Whitehall Distinctive two-sided mailbox signs. These ornaments are made of recycled aluminum and finished to withstand the harshest elements. Choose from 14 different styles. Choose colors: color (shown), or black. Two Sides with One Line: holds up to sixteen 1.25" characters. For over 70 years, Whitehall has been crafting personalized name and address plaques to provide a distinctive finishing touch to millions of homes. Renown as the world’s largest manufacturer of personalized name and address plaques, Whitehall’s reputation for quality and reliability is unsurpassed. Each plaque is hand-crafted in the USA from rust-free, recycled aluminum. Paints have been specially formulated and weather-tested to withstand the harshest elements, and many Whitehall address plaques are designed to provide maximum visibility to meet local “911” emergency standards. Ask to see their Personalized Plaque and Marker Catalog. This exciting category boasts rich designs and 3-dimensional construction with high-relief numbers! 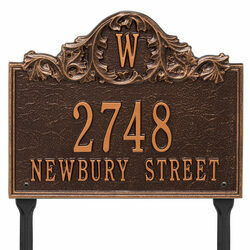 The majestic Acanthus address plaque permanently showcases your address or greeting, plus a single letter monogram! 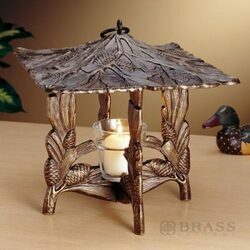 Styles include architectural, decorative, oval, vertical, specialty, entryway, and memorials! 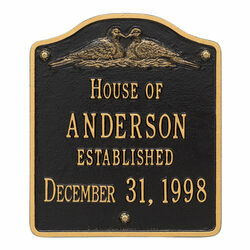 These plaques will add the finishing touch to your home and instantly improve curb appeal. Made from rust-free cast aluminum providing excellent quality and durability! A highly unique personalized gift that commemorates weddings, anniversaries and other special dates. Can be mounted indoors or outdoors. The perfect wedding gift! 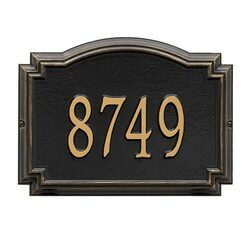 The high relief frame of the Williamsburg house number plaque provides a distinctive appearance that helps your entryway to stand out from the rest. 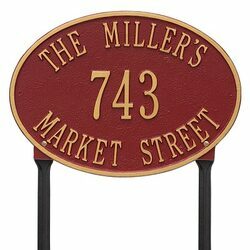 Add this beautiful Home address plaque to your list of gift ideas for any occasion! 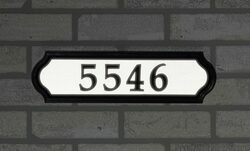 Provides traffic grade reflectivity allowing your address to be easily seen. soldiers or our United Nation. Remind your neighbors to be responsible and respectful by curbing their dogs. These durable, cast aluminum lawn stakes are designed to be usable in any outdoor space. 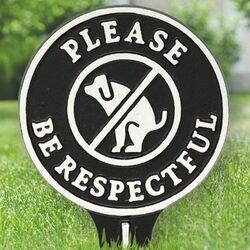 These jovial and effective lawn stakes will persuade dog owners to respect your boundaries and politely clean up their pet’s mess. A great option to attractively maintain curb appeal while delivering your neighborly message. Manufactured from recycled aluminum to prevent rust and corrosion. Single unit marker makes for easy installation with lawn piercing stake. Choose color combinations: Black / Gold, Black / White, Green / Gold, White / Black. 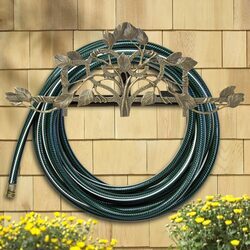 Whitehall’s decorative garden accents cover a broad range of products including hose holders, signs, Nature™ Hooks, birdbaths, and lanterns. See ALL images below in Our Garden Accents Image Gallery. These beautifully sculpted wall mounted hose holders are sure to become one of your most-used garden tools. They will accommodate up to 100 ft. of hose. Each piece is crafted from rust-free recycled aluminum and carefully finished with durable paints for years to use. Mounting bracket and hardware included. Made in the USA. Choose Colors: Oil Rub Bronze, Copper Verdi, French Bronze. Create a welcoming atmosphere in your garden. 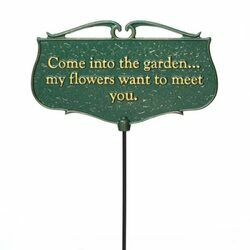 These large, easy to see poems plaques are crafted from rust-free recycled aluminum and are finished with gold highlights against forest green. A 17 in. lawn stake is included. Made in the USA. Choose from 6 different signs. 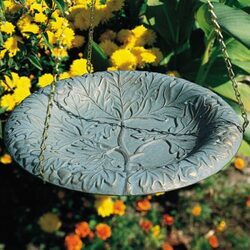 Whitehall Products hanging birdbaths will give your birds a perfect place to take a bath. Each piece is crafted from rust-free recycled aluminum and carefully finished with weather-resistant paints to hold up to the most rugged outdoor elements. Made in the USA. Choose from: Dragonfly and Oak Leaf (shown). Choose Colors: Copper Verdi, French Bronze, or Oil Rubbed Bronze. 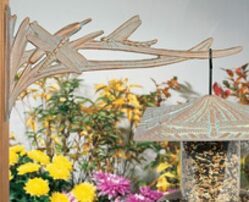 Enjoy the relaxing hobby of bird watching in your garden with the Dragonfly Garden Bird Feeder. 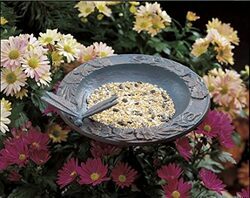 The beautiful feeder adds a decorative touch to both your home and garden. Rust proof. Weather resistant. Hand cast. Hand painted. Manufactured from 100% recycled aluminum. For centuries, sundials have been used to mark the passage of time while reminding us of the rhythms of our universe. 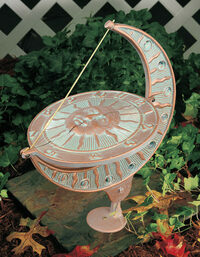 Whitehall's elegant collection of uniquely styled sundials are functional garden accents. Each piece is crafted from rust-free recycled aluminum and carefully finished with weather resistant paints to withstand any climate. From standard styles to combination sundial/birdbaths, Whitehall’s variety is unmatched in the marketplace. Choose Colors: Copper Verdi (shown), French Bronze, and Oil Rubbed Bronze. A great home accent that is perfect for holding a hanging plant, bird feeders, wind chimes and more. Unique nature theme compliments your outdoor garden decor. Makes a great gift. Manufactured from die cast, high-density aluminum alloy/Alumi-Shield All Weather Coating: protects against the harshest weather and environmental elements. Choose Colors: Copper Verdi or French Bronze. Create a beautiful and ambient setting in your backyard, garden, or even inside your enclosed porch with this Pinecone Twilight lantern . This lantern will set the mood with soft flickering silhouettes. Hand crafted from rust-free recycled aluminum and finished with weather resistant paints to last a lifetime. Made in the USA.